Should broadcast radio be required to pay royalties to labels and recording artists for use of their records? There are arguments on both sides, and the stalemate reinforces inertia. But the debate is heating up, gaining publicity, and creating awareness of an issue that many people don’t know about. The Content Creators Coalition shone light on an often-disregarded wrinkle in U.S. copyright law this week, by staging the Artists’ Pay for Radio Play Rally in New York City. 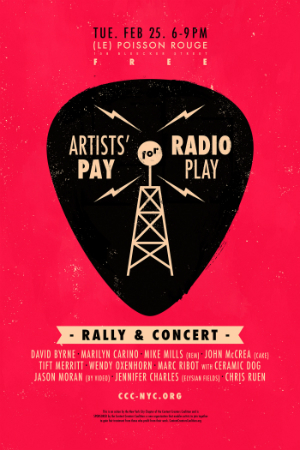 The apostrophe in the event’s title is important — the rally was obviously not about artists paying for radio play, but about the fact the radio does not pay royalties to recording artists. David Byrne, recently noted for his outraged criticism of streaming services, was the headline performer. Raising awareness of a perceived inequity in copyright regulations was the point. The exemption law dates back to 1972, when sound recordings were codified in U.S. copyright law. At that time, radio lobbies successfully argued that the promotional benefit of airplay was payment enough. The argument succeeded in an era when music-recording revenue came mainly from product purchases — LP records at the time; CDs later. In 2014, however, pure listening, of both broadcast and Internet streams, is quickly becoming a primary way that consumers acquire music. Product sales (CDs and downloaded albums/singles) have fallen dramatically. In this relatively new market environment, The Content Creators Coalition can make an easy argument that radio, with its extensive reach across the country and ability to make many millions of song impressions, is the biggest appropriator of music content, and accounts for an unfair revenue shortfall to performers and labels. But it’s not that simple. The country’s largest radio group, operated by Clear Channel, works out private royalty-paying deals with large and small record labels. The most important arrangement of that kind to date is with Warner Music Group, one of the biggest label clusters in the world. So free-market mechanisms can potentially plug the revenue void created by radio’s no-charge access to music recordings. Establishing free-market solutions was the point of the Free Market Royalty Act, introduced to Congress last October, where it lies dormant after its sponsor, Rep. Mel Watt, left Congress to head the Federal Housing Finance Agency. Radio has an easy argument, too, when it opposes the addition of a potentially huge new expense to its stations’ balance sheets. On the online side of the fence, where artist royalties are mandated, market leader Pandora pays nearly half its revenue to labels and performers. It’s understandable that radio might resist a major change to its cost model. The National Association of Broadcasters (NAB) opposes the recently introduced Songwriters Equity Act, which seeks an incremental raise of royalty payments to publishers and composers — a cost that would probably have less financial impact than establishing a brand new royalty payout to labels and performers. Webcasters aren’t pleased with the uneven ground, either. There is continual publicity of the fact that major music services are unprofitable, with one recent study claiming that they will never get into the black under the current royalty structure. The easy argument for webcasters is that radio, Internet radio, and subscription services provide about the same promotional value to musicians in a market that is shifting from owning music to accessing music. The follow-through of that argument is that all listening platforms should operate with the same royalty obligations. Change comes slowly, if at all, when law is argued by well-funded industries in opposition. There is no question that the playing field is uneven. The arguments around fairness and feasibility are not so simple. In the meantime, one sign of progress, thanks to publicity events like Artists’ Pay for Radio Play, is to raise awareness of royalty complexities among music lovers and creators alike. If nothing else, perhaps we’ll eventually see fewer simplistic condemnations of streaming, which, after all, does pay for playing. The notion that broadcast radio of all types have to pay anything for airplay is ridiculous. If an artist, songwriter, composer or publisher had to pay to promote their product out of pocket, how much would they have to invest? Thanks to Radio they not only get their work promoted, they get paid to for it. Common sense tells you it should be the other way around. Bands get the benefit of free promotion, which leads to the sales of music, merch and tickets. Stop whining, you’re lucky we have a corrupt government system to stupid to realize the music business has been screwing radio for decades.